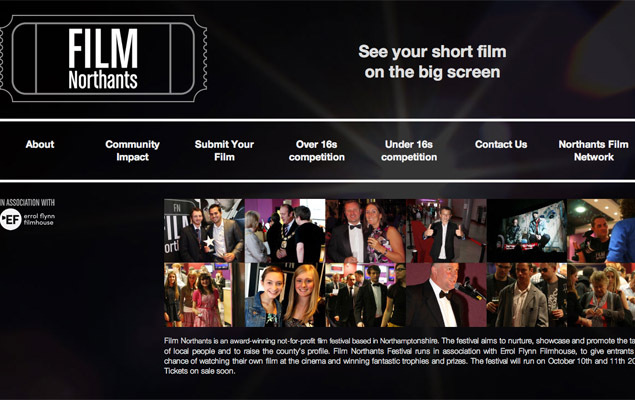 Submissions for the 2015 Film Northants Festival are now open. The deadline for competition films is August 2nd and the deadline for out of competition films is June 28th. See the bottom of the page for a complete list of our rules. Film Northants is an award-winning not-for-profit film festival set up in 2008. The organisation aims to nurture, showcase and promote the talent of people in Northamptonshire and to raise the county’s profile. In 2011 Film Northants was winner in the Pride in Northants awards for the category of Raising the Profile of Northamptonshire. The same year Film Northants teamed up with the Favourites Film Festival in Berlin and winners of the Film Northants public vote were submitted to the international event. Film Northants runs in association with Errol Flynn Filmhouse, to give entrants the chance of watching their own film at the cinema and winning fantastic trophies and prizes. The festival has a range of partners each year who help with finance, promotions and prizes. The festival accepts both in competition and out of competition entries. The competition films can be entered into the Under 16s or Over 16s categories via the Enter Now page. The out of competition films can be of any genre or length – the only criteria is that they are made by Northamptonshire film-makers.